I've got an odd question I'd throw out to the interwebs since I don't have the time to really do any research on it now. 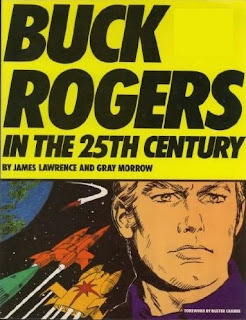 I've found a book entitled, simply, Buck Rogers in the 25th Century. It's by James Lawrence and Gray Morrow, published in 1981. Foreword by Buster Crabbe. It appears to be reprints from some of the newspaper strips, reconfigured to fit a 'graphic novel' format. Panels have clearly been cut, cropped and resized throughout the book. Several sequences suggest a daily newspaper strip format. Indeed the copyright is attributed to The New York Times Syndicate. What I'm curious about -- and I don't see anywhere in the book itself -- is A) confirmation that these are strip reprints and B) when they originally ran. Interesting, too, I think would be the relation these strips had back to the TV show of that time period. The character and uniform designs seem to be largely original, but Twiki and some of the starships are clearly the same designs as what appear in the Gil Gerard show. Any info and/or insights would be appreciated. Wikipedia says thusly that Lawrence and Morrow handled the revival of the strip series from Sep '79 to Feb '81, with the September debut also running in Heavy Metal magazine, of all places. Cary Bates took over writing chores and continued with Morrow until Jun '82.